Now a days there is an operating system war in mobile market. Every player of this regularly do some changes to get more attention of users. Android winning this war by defeating Symbian and iOS. Now Nokia also took some care and tie up with Windows OS (Which is too late) and Nokia also launched its Windows Phone Lumia 800 which is catching everyone's eye. Few time ago, Nokia said that they will change their OVI Services with Nokia Services till 2012. And now they did it. 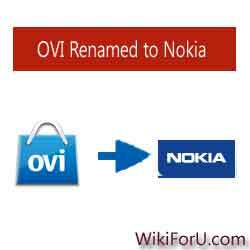 Now all OVI has been renamed to Nokia. OVI Store becomes Nokia Store, OVI Mail becomes Nokia Mail, OVI Music becomes Nokia Music and so on. It sounds good. Most Nokia Users and Tech-Experts appreciated it. The address for Nokia Store is still old one that is store.ovi.com but they may also change it. The content of Store also updated. Now there is something more than just applications and Games. Now you can download Themes, Wallpapers and Music from Nokia store. Nokia further said that The renaming or changing the name or logo doesn't shows any effect on the working of store and other services. They said that they changed just name and didn't change anything else like content and user-interface. Why Nokia made this change ? This question may arise when you reading this article. There may be many causes for doing so. Generally, the Nokia Store is a good name instead of OVI Store. It provides a quick information that the store is related to Nokia. While if a person who don't know about technology terms, hear first time "OVI Store" then he will not get the point, as when he listen to "Nokia Store", he will obviously understand that this is App Store of Nokia . One other cause may be this, As before Google changes its User-Interface of Android's Market. Apple have the brand name iStore. For these reasons Nokia may did this change. How this inspire You? What you like in this Changing and What you don't Like? Please give us your feedback via comments.